Texas Democrats face a true juggernaut in this year's race for governor, and they'll need a juggernaut of their own to pull it off. Last week's debate illustrated how much work they'll have to do to compete. This is Texas politics writ small. 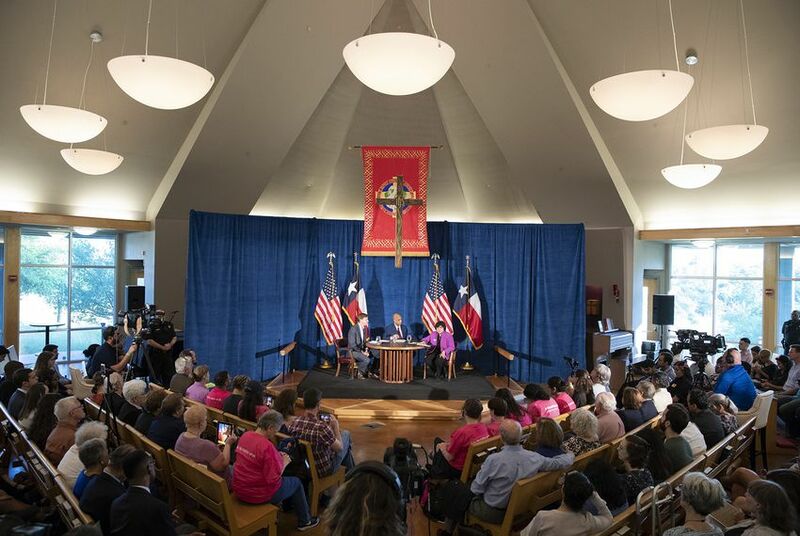 St. James' Episcopal Church was not full on Friday night — not by a long shot — 13 minutes before the only debate in the runoff for the Democratic nomination for governor of Texas. And that’s not because it was some cavernous cathedral; it’s more like a 300-seat sanctuary. A few minutes before the candidates took the stage, the moderator, Gromer Jeffers of The Dallas Morning News, took the audience through the agreed-upon rules, asked them to be quiet throughout the debate and thanked the hosts for the hard work of putting together an event that frankly looked unlikely until just days before it came together. He noted that Democrats were talking a year ago about the big-name candidates that might run against Republican Gov. Greg Abbott, and said these candidates, Andrew White and Lupe Valdez, deserve congratulations for entering the arena. Neither has run for statewide office. Valdez was elected four times as Dallas County sheriff, a job she resigned from to run for governor. White, son of the late former Gov. Mark White, a Democrat, has never run for anything. They aren’t the political stars some party regulars were pining for. This wasn’t the sort of event you’d expect in the first major-party runoff for governor since Ann Richards beat Jim Mattox in 1990. Heck, it wasn’t even the size of some forums for down-ballot and local races around Texas — including those involving the two Travis County Democrats in a runoff for the House district where St. James is located. The debate went more or less as expected. Valdez led with her life story and a parable about her muddy shoes, one that’s familiar to anyone who’s heard her on the stump (or who read Texas Tribune reporter Brandon Formby’s recent story on Valdez). She said she has spent her life in public service, in the military and in law enforcement. “Don’t tell me this Latina cannot lead,” she said. The candidates answered questions about abortion, taxes, immigration and a range of other subjects. It was a pretty good look at how they handle themselves. They have some reasonable ideas, the kinds of policy plans you hear in debates from states with two viable major parties. They’re both smart enough to know where the minefields are; both, for instance, said there’s no way they’ll support an income tax for Texas. That’s not going to be enough. Abbott and his fellow Republicans are riding a wave of momentum. Some of them have talent, too, but the table is tilted their way. In recent Texas history, a lousy statewide Republican candidate can beat an outstanding Democratic candidate in a statewide race. White has made some headway, becoming a better candidate every month. Valdez held her own in Friday’s debate, but her policy talk is vague. White looked like the better candidate in the forum, but the audience was so small it might make no difference. Valdez finished first in the March primary, entering the runoff with an advantage. Maybe the news media coverage of the race in general, and of the debate in particular, will reach enough eyes and ears to inform voters in this runoff. The debate wasn’t televised statewide, only appearing on cable stations in Austin and San Antonio, and it was livestreamed by KXAN-TV in Austin and The Texas Tribune. It’ll be a small runoff turnout — but that’s distressingly normal in Texas. For the candidate still standing on May 23, the day after the runoff, the coming months will be hard ones. To make the general election contest with Abbott a real debate, much less a real race, the winner of this runoff will have to overcome recent history, campaign money and an established statewide politician who’s popular with voters. Here’s one way to look at the hill ahead: The election is 26 weeks from now and the governor has a little over $43 million in his campaign accounts. He could spend $1.6 million a week on this race and have money left over at the end. Neither White nor Valdez has enough money now to match even a week of that. The Democratic nominee is going to need something that is both dramatic and that moves a lot of Texans to turn this race into more than a curiosity. They’ll need enough excitement to fill an East Austin church on a Friday night.